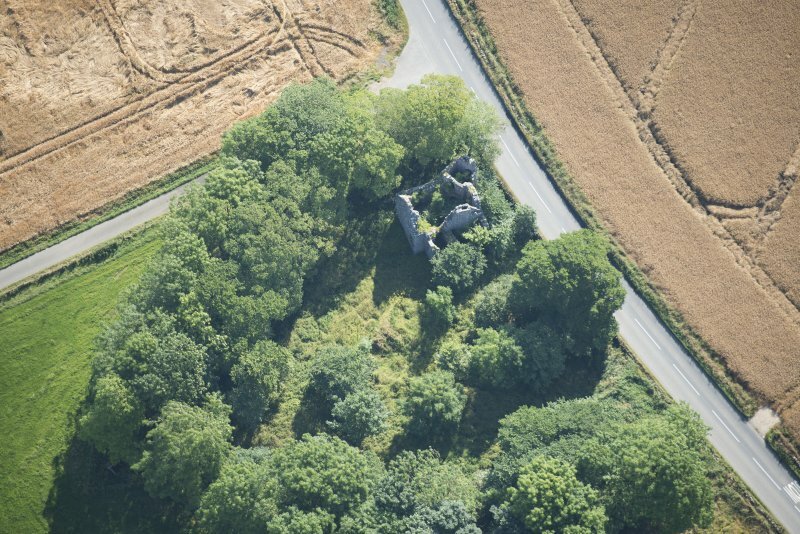 Oblique aerial view centred on the remains of the castle and tower-house, taken from the NW. 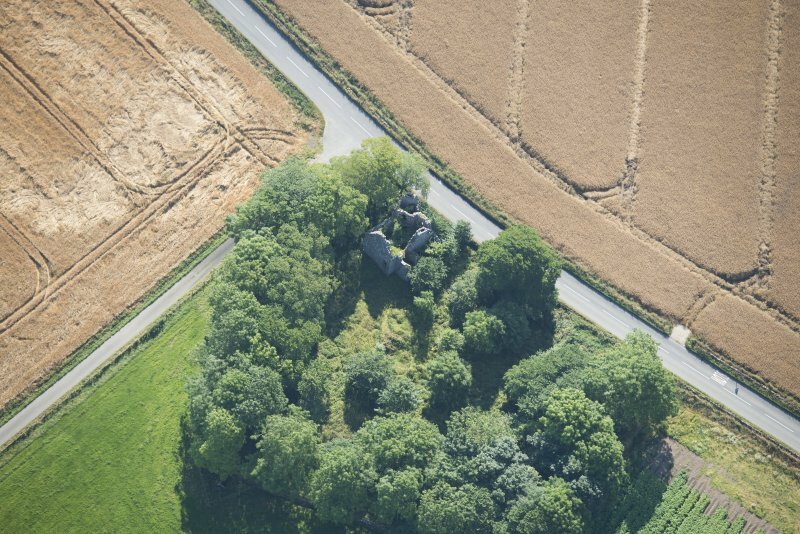 Castle of Esslemont: view from W.
Oblique aerial view centred on the remains of the castle and tower-house, taken from the SE. 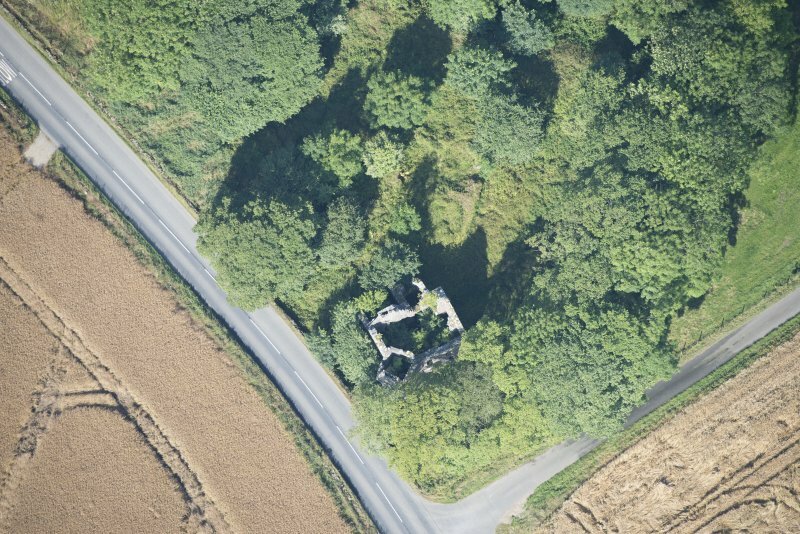 Oblique aerial view of Castle of Esslemont, looking NNE. 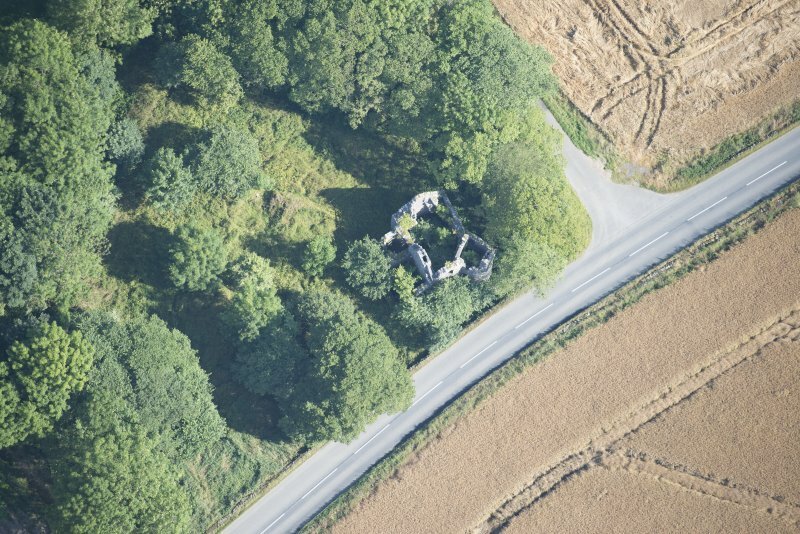 Oblique aerial view centred on the remains of the castle and tower-house, taken from the WSW. 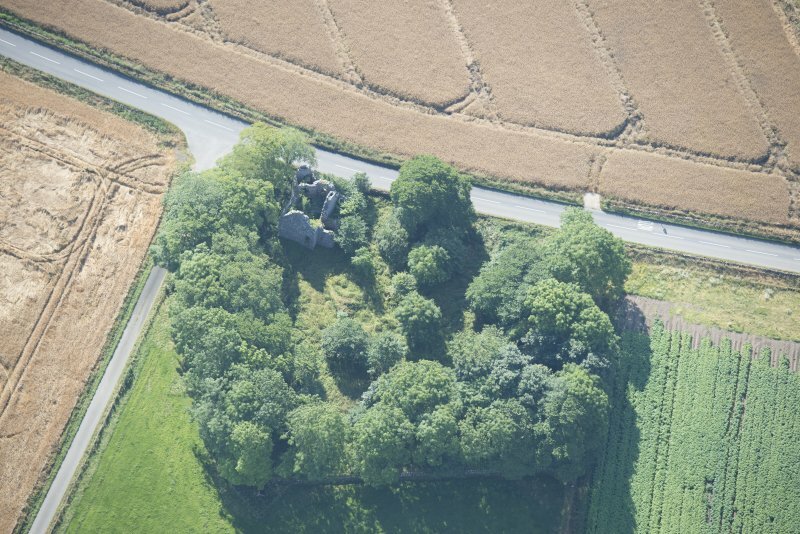 Oblique aerial view of Castle of Esslemont, looking ESE. 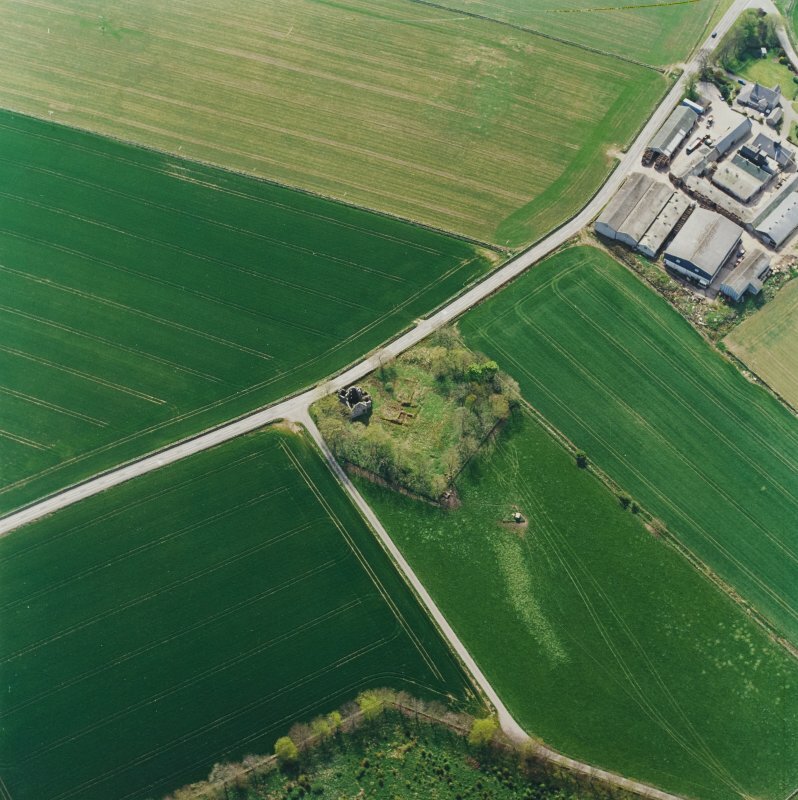 Oblique aerial view centred on the remains of the castle and tower-house, taken from the N.
Plan of the moated enclosure (I) and tower houses successively built in the centre of the interior (II), and across the line of the perimeter on the east (III). 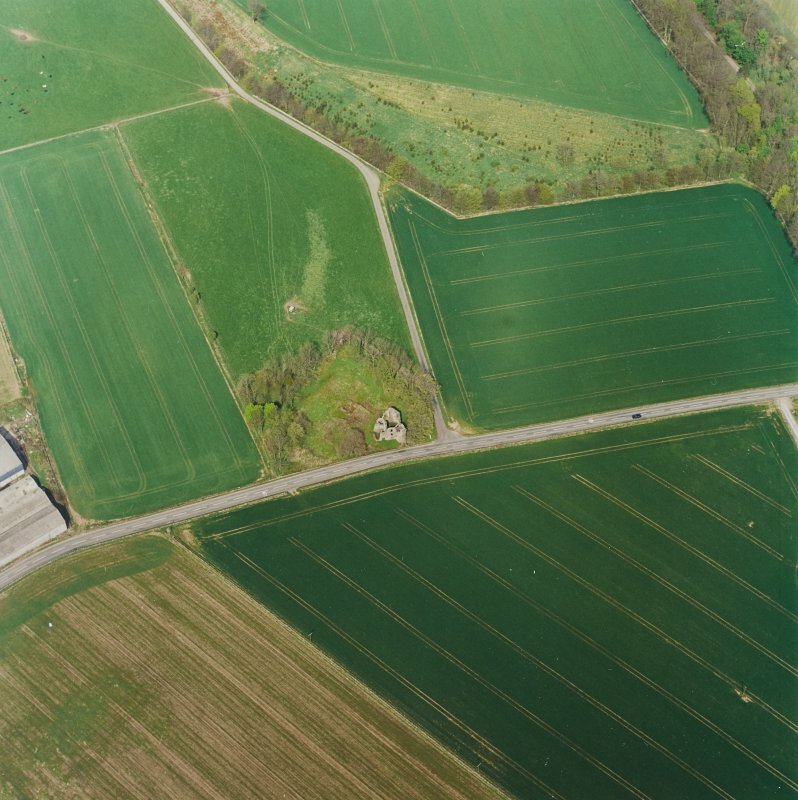 Oblique aerial view of Castle of Esslemont, looking W.
Oblique aerial view of Castle of Esslemont, looking NW. Oblique aerial view of Castle of Esslemont, looking N.
Oblique aerial view of Castle of Esslemont, looking SE. 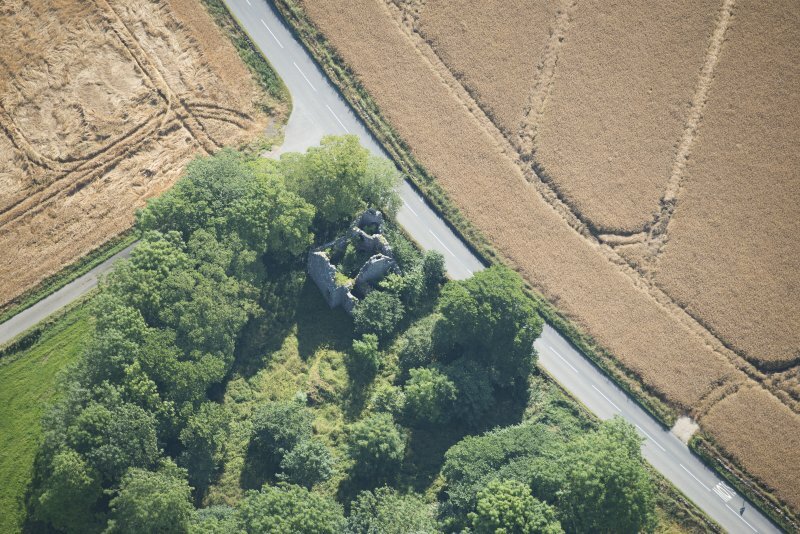 Oblique aerial view centred on the remains of the castle and tower-house, taken from the ENE. 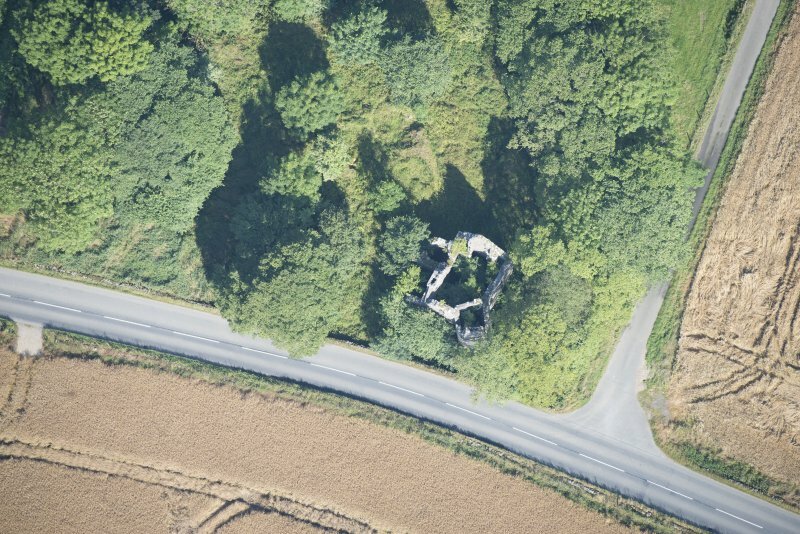 Oblique aerial view of Castle of Esslemont, looking NNW. 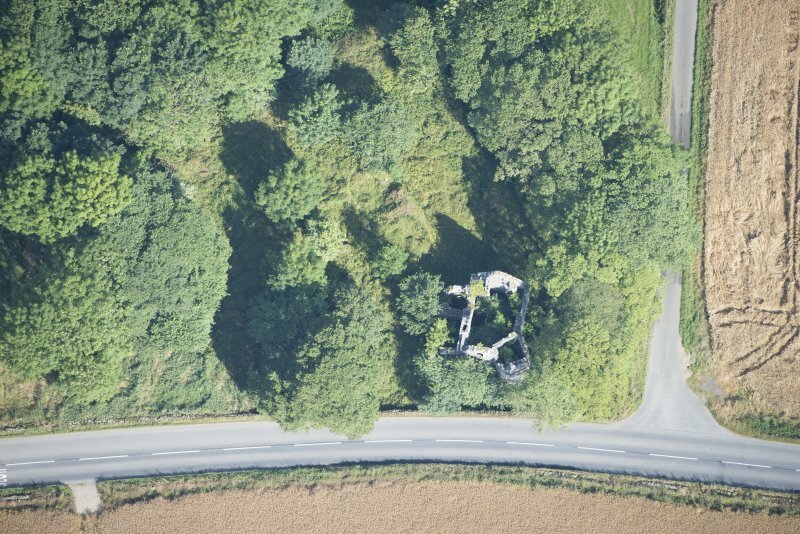 Oblique aerial view of Castle of Esslemont, looking NE. Oblique aerial view of Castle of Esslemont, looking E.
Oblique aerial view of Castle of Esslemont, looking WNW. For Esslemont House (NJ 9322 3044) and related buildings, see NJ93SW 38.00. The manor of Eislemont is first mentioned in the 14th century when it was held by the family of Mareschal. In 1493, the castle was destroyed by fire, and in 1500 a royal license was granted to build another castle which, according to Simpson (1944), was not erected until c.1570-90. This latter, a 3-storey, L-shaped towerhouse, survives as a roofless shell with square staircase in the re-entrant angle, and a large round tower appended to the E corner. It stands on the E side of a ditched enclosure. 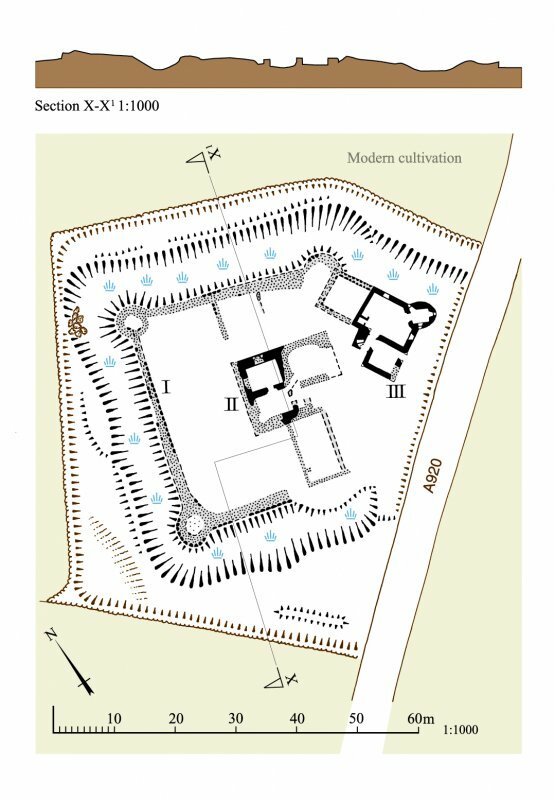 In 1938 excavations within the enclosure revealed the lower courses of the earlier castle, a massive, L-shaped towerhouse, c.55' by 42' over the two long sides, with walls 6-7' thick and 6' maximum height. It was fire-marked, indicating that it was the castle destroyed in 1493. 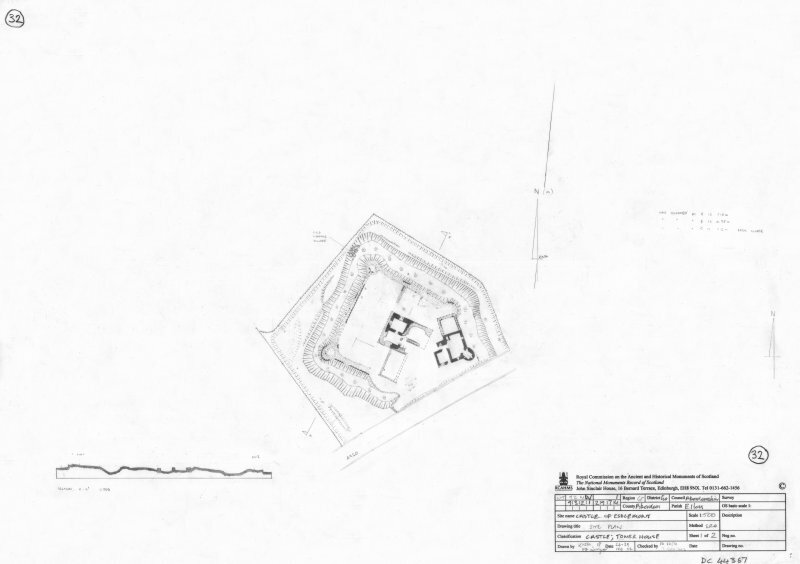 The plan and details suggested an early 15th century date (post-dating the manor mentioned in the 14th century). The remains of an enclosure, probably contemporary with the later 16th century towerhouse is built against the S wall. On the scarp of the surrounding ditch, had been a curtain wall 4 feet thick, with an external heel making a basal thickness of 8 feet. 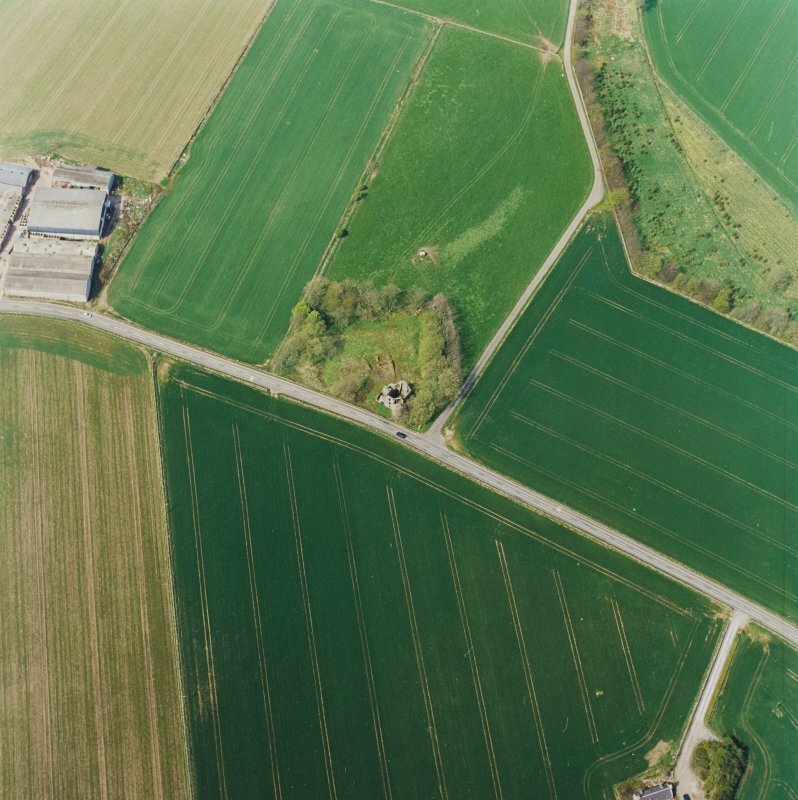 At the W corners were two round towers c.19' diameter, and the mutilated remains of a third on the NE side. The round tower of the later 16th century towerhouse may be built over an earlier enceinte tower, as the curtain wall panes beneath the later structure which has an enclosure attached to its N wall. A cross wall connects the curtain wall to the N side of the earlier tower-house. 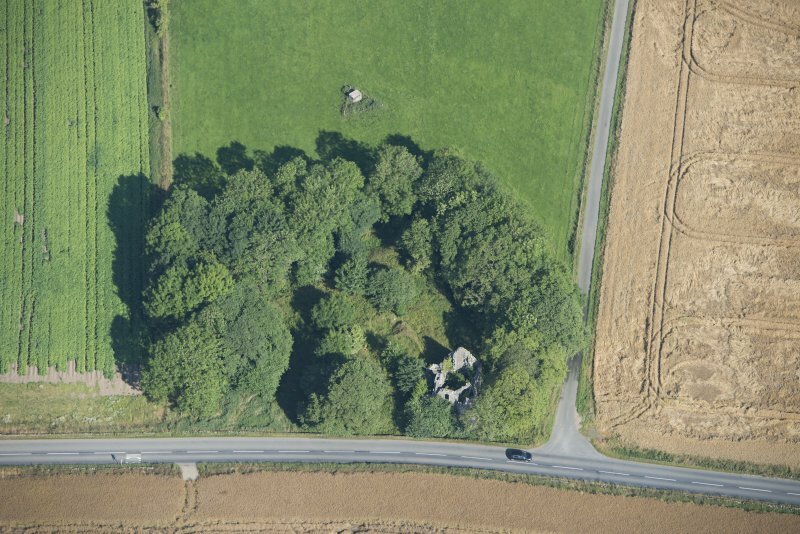 The surrounding ditch may date from the 14th century. Finds include 14/15th century potsherds, a medallion, and a worn shilling of William III. 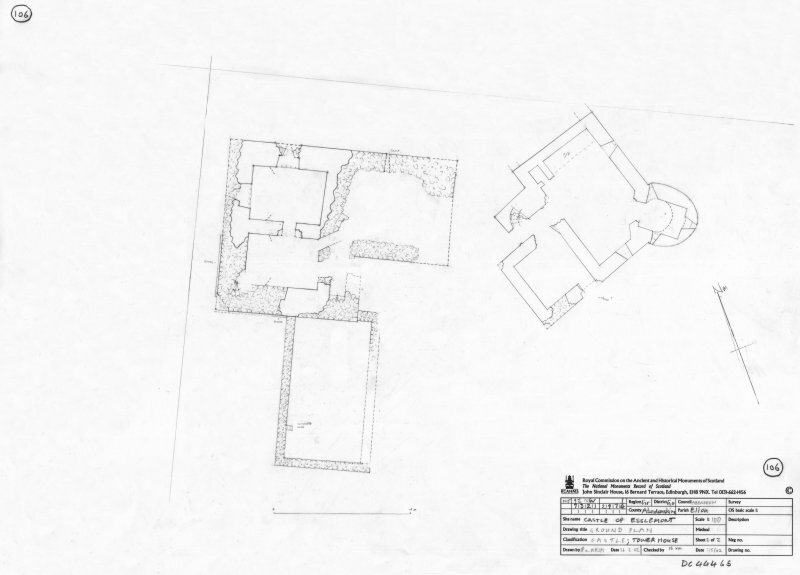 Castle of Esslemont as described and planned by Simpson (1944). Visited by OS (RL) 13 April 1972. This site is generally as previously described. Simpson's excavations have not been back-filled and the site is overgrown and disorderly. (Location cited as NJ 9321 2974 and name as Castle of Esslemont: nominated as Site of Regional Significance). Remains of castle. In 1493 the castle was destroyed by fire, and another was not erected until the latter part of the 6th century. This three-storey L-plan tower-house survives as a roofless shell with a square staircase in the re-entrant and a large round tower appended to the E corner. It stands on the side of a ditched enclosure. 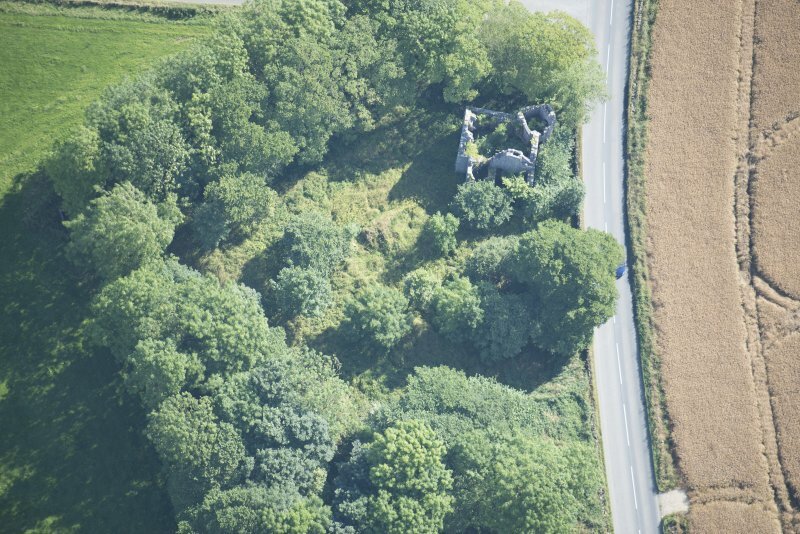 Excavation has revealed the lower courses of the earlier castle, a massive L-shaped tower-house over two long sides, probably early 15th century. The remains of an enclosure, probably contemporary with the later castle, are built against the S wall. On the scarp of the surrounding ditch a curtain wall had stood, with an external heel. At the W corner were two round towers and the mutilated remains of a third on the NE side. 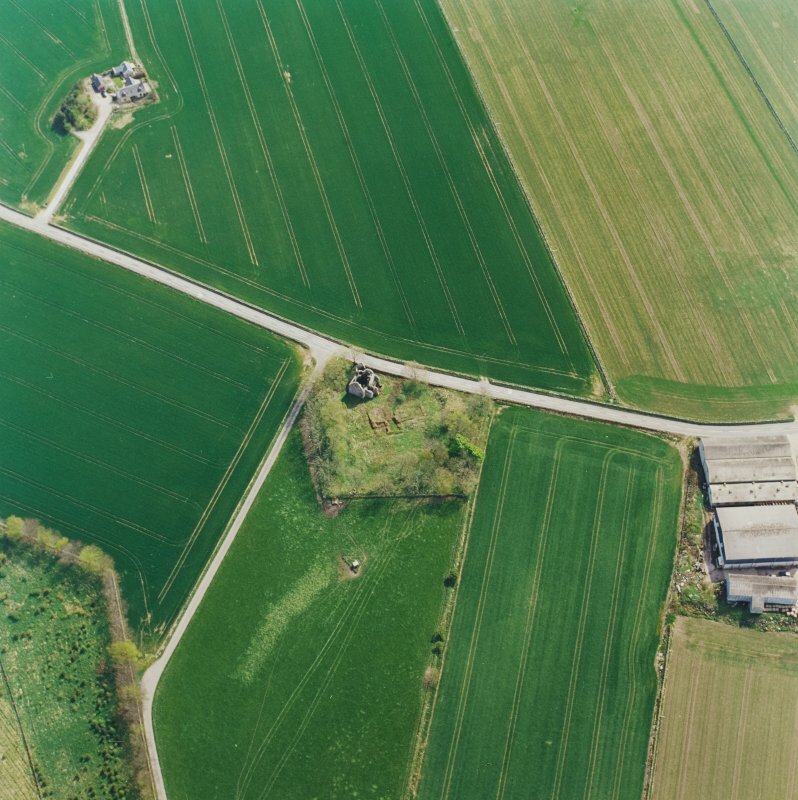 The round tower of the later castle may be built over an earlier enceinte tower. A cross wall connects the curtain wall to the N side of the earlier tower-house. 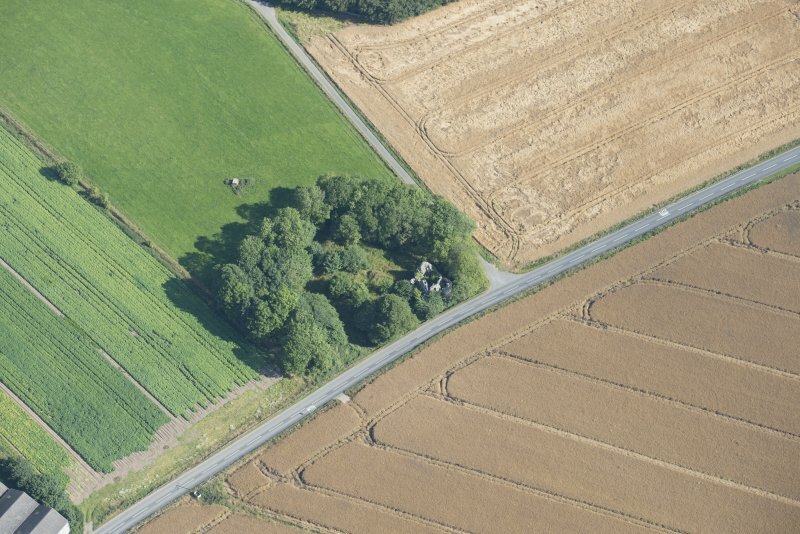 The surrounding ditch may date from the 14th century. (Classification amended to: Moated Site; Castle; Tower-house). 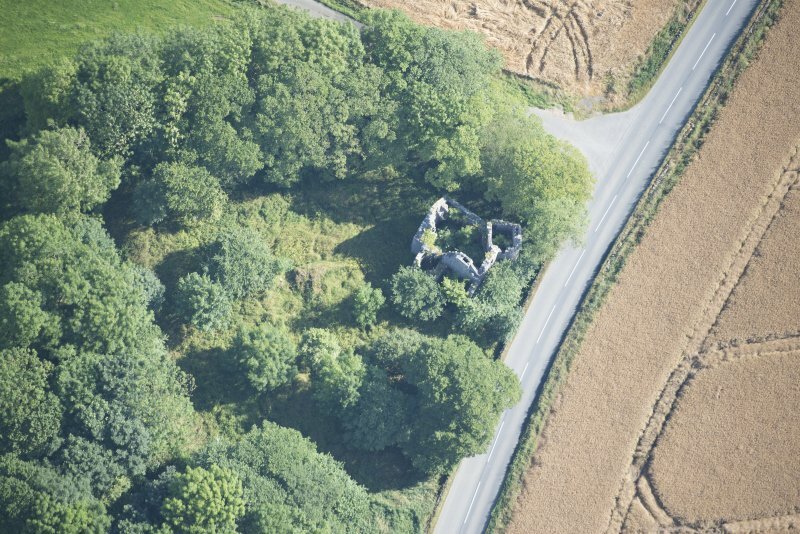 Lying in a small plantation beside the A920, Esslemont Castle comprises three main elements; a medieval moated enclosure; an early 16th-century L-shaped tower-house; and a Renaissance-style tower-house of late 16th-century date. 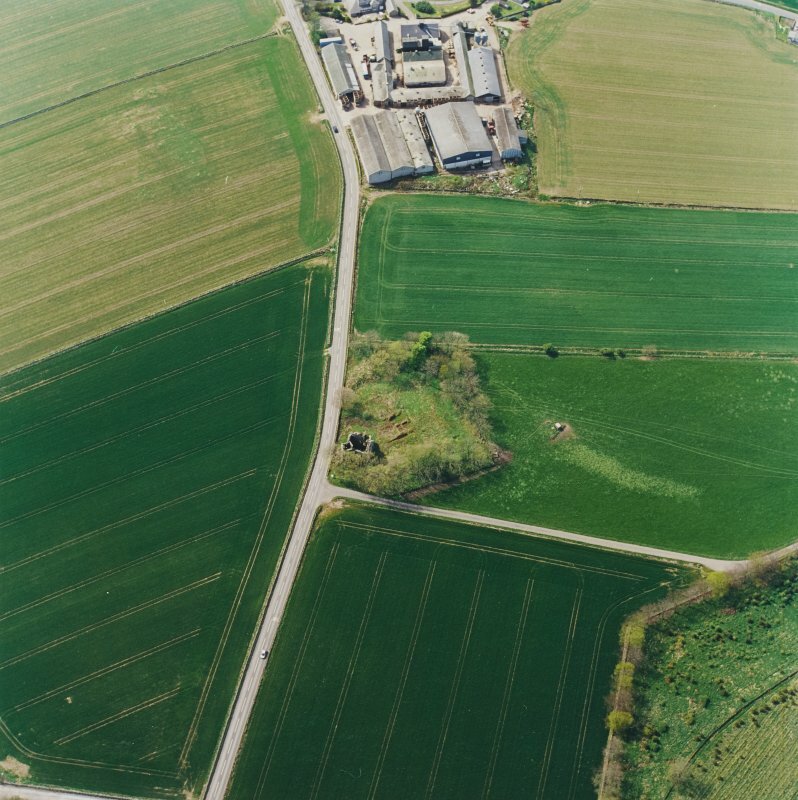 Consequently the site encapsulates the main stages in the development of manorial structures of the period from about 1250 to 1650. 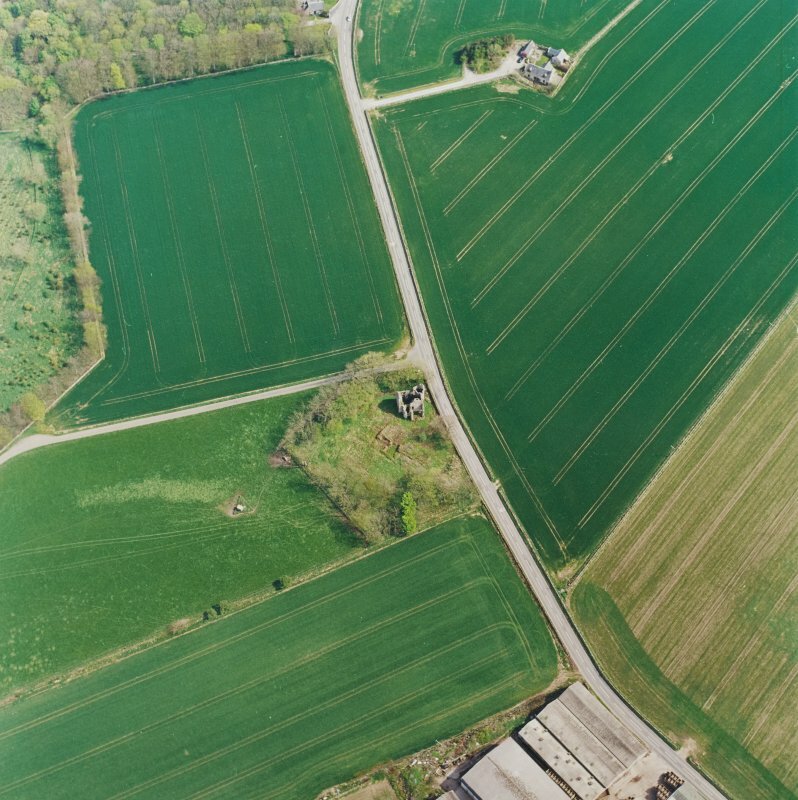 The moated enclosure measures 37m from NNE to SSW by about 35m transversely within a ditch 9m in breadth and 2m in depth. On the inner lip of the ditch, there is a curtain wall 1.2m thick. Excavations have revealed an external heel to the wall, suggesting a basal thickness of 2.4m, although this may belong to an earlier phase of construction. Round towers some 5.8m in diameter stood at the corners, though only three now survive, the fourth, on the SE, having been removed and the moat infilled to construct the later of the two tower-houses. The earlier tower-house is aligned to respect the axes of the moat, and would have stood entirely within it, until the addition of a wing on the SW (see below), which required the slighting of the curtain and moat. The tower-house is a massive L-shaped building, measuring 16.75m by 12.8m along the two long sides, with walls 2m thick standing to 1.8m in height. This structure was revealed in Simpson's excavations in 1938. Simpson (1944) noted signs of burning on the footings of the tower, but these were not evident at the date of survey. The tower has three main chambers on the ground floor not unlike Colquhonnie ((NJ31SE 2) in Strathdon. This includes a lobby with a stair immediately inside the entrance on the S. From here there was direct access to a room in the basement from which the kitchen and a store were reached. All basement rooms were vaulted, springers for them being visible in each case, and each room was lit by slit windows. The structure that is built against the SW wall of this tower was explained by Simpson as an enclosure, but is more likely to have been a two-storey wing, measuring 11m by 7m transversely over walls 0.6m in thickness, and accessible from the stair just inside the entrance to the tower. The quality of the construction of this wing suggests that it is of an 18th century date. The Renaissance-style tower-house, which has much less substantial walls and a turret with architectural rather than defensive qualities, is built across the line of the ditch on the ESE side. It is L-shaped on plan, and the decorative round turret is at its SE corner. Measuring 12.4m from NE to SW by 10.5m transversely over walls 1m in thickness, it contains a basement and two upper floors. The kitchen is in the basement, which is not vaulted, and has a large fireplace in the NW gable. Access to the upper floors is via a newel stair to the left of the entrance, which is itself in a turret in the return between the NW and SW wings. Corbels at the top of the round turret on the SE indicate a square chamber, now gone, but it is also evident from the wall-facings that the rooms inside the turret itself were squared. A first floor entrance provides access to an additional wing on the NW that has been reduced to its footings. The building is characteristic of a late 16th or early 17th century tower-house. The addition of the later wing on the earlier tower-house implies that the earlier tower-house was still is use in the 18th century and that the two buildings were both occupied at the same time (contra Simpson 1944). Esslemont was a manor of the Marischal family in the 14th century, and passed by marriage to the Cheyne family (Simpson 1944). Following a fire and destruction of the 'place of Essilmont' in 1493 (Robertson 1843), Henry Cheyne was given licence to build a tower and fortalice at Essilmont in 1500 (Robertson 1843). 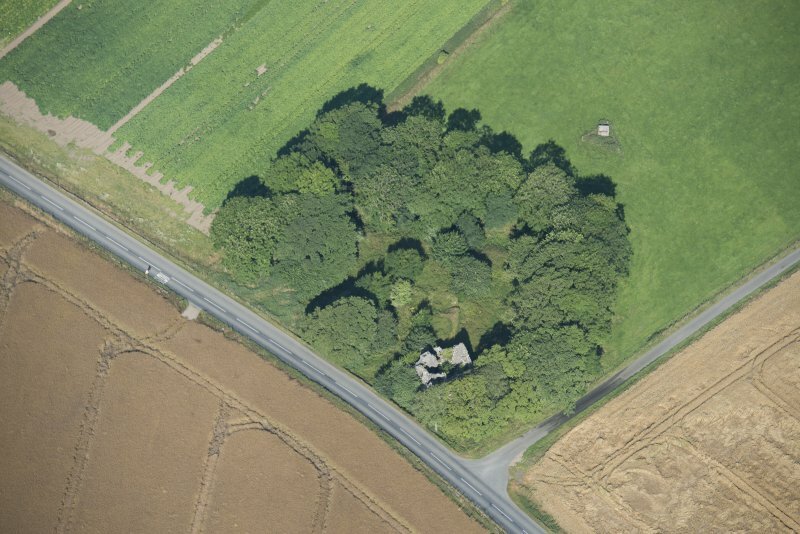 Esslemont is described as a 'fortalice and manor' in a charter of 1515-16 to Patrick and Alexander Cheyne, which suggests that a suitable defensive structure had been built (Reg Magni Sig Reg Scot). In 1564 Patrick Cheyne was created baron of Esslemont by Queen Mary, who stayed here during her campaign against the Earl of Huntly, and a fortalice and tower were recorded in 1575-6 (Reg Magni Sig Reg Scot 1984d, 681). 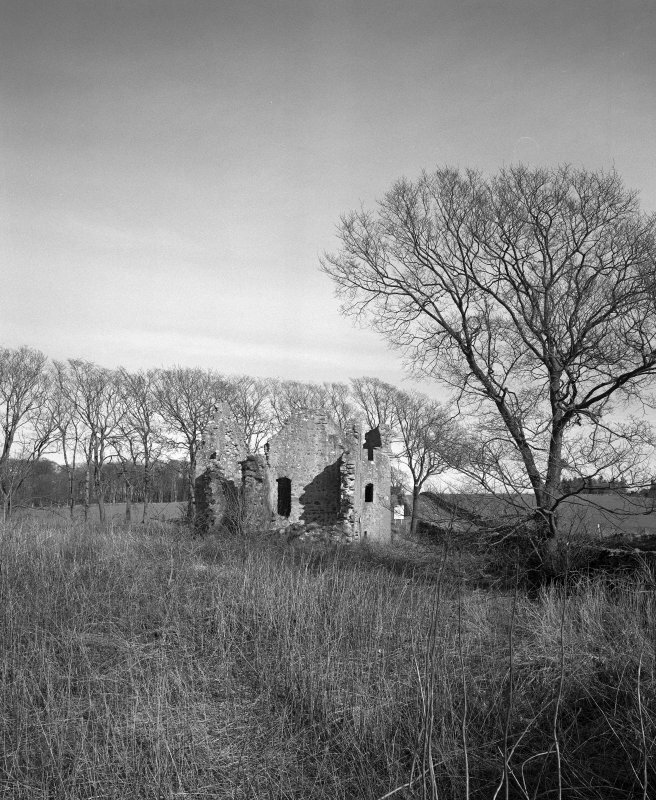 The site was abandoned for the country house that occupies the policies to the NW in 1799 (Simpson 1944). Visited by RCAHMS (PJD) 17 May 2001 and 26 February 2002. J Robertson 1843; W D Simpson 1944; Reg Magni Sig Reg Scot.